Why place Recruitment Ad in Sikkim Express Newspaper ? You can use our online ad booking portal to successfully book your ads on Sikkim Express’s Recruitment section in 10 mins. You do not need to pay any additional fees to book your ads online. In fact, you get to book your ads at unbelievably low advertising rates. You can track the progression of your ad until it is finally processed for printing. We believe in transparency and customer satisfaction. releaseMyAd offers you numerous payment gateways to clear payment. 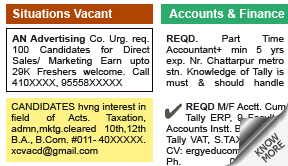 A large section of Sikkim Express’s active readership regularly check the recruitment ads section. Recruitment ads are released by companies who are looking to hire new employees, and these ads usually comprise the basic educational qualifications one needs to apply, the job role to be offered, and contact details. Some ads list a number of skills applicants need to possess, along with a few details about the job such as if it would require travelling, or if aspirants need to possess a vehicle to apply for the job. • Wanted a Lab-attendant passed class 8 (Age limit 37/42 years) Apply to the Secretary,Rampur Girls’ Mahakali Pathsala,P.O.Khagra,Ahmedabad,within ten days of this advertisement along with testimonials. 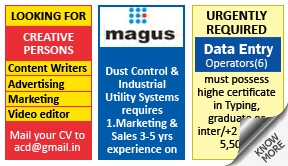 • WANTED Sales/Marketing Executives For reputed IT org .Salary-on commision based.Contact: 09830629298. How To Book Recruitment Ad in Sikkim Express Newspaper ? Choose your Advertising Location from the section above. You can also take a look at the combo deals on display and have your pick. Compose your ad. You can view sample ads by clicking on the appropriate tab. Select which date you would like to advertise in & clear your advertising bill via a host of online & offline payment options. If you want to book your Recruitment ads right now, view rates and choose your location to proceed with the booking process. Alternatively, you can view a few sample ads or get some additional information about Recruitment ads by clicking on the appropriate tab above.